Announcements made, tickets on sale, planning in progress. This is a nice way to start the year! I’ll need to send that poster off to print soon, so that we have plenty of flyers over the next thirty weeks. Oh, and before I forget, I was lucky enough to be invited on the Insert Quest Here podcast to chat with Ray (NewConOz) and Hayley (ArcanaCon) about Con Org Stuff: insertquesthere.com/2018/12/iqh-presents-convention-chats/ — many thanks to Hayley & Ray for your time, thoughts, and audiences! This week, I’d like to talk about what I’m trying to achieve in our preliminary planning for the event, and some of the ideas in the back of my mind, whether or not they come to fruition this year, or at all. As much as I wanted to achieve a two-day event this year, I’m feeling very lucky that we were able to choose a date which [a] didn’t directly clash with any announced conventions (although I would’ve preferred to give NewConOz more room, if I’d realised they were eyeing the weekend after us), [b] suited not only Aetherworks (who had reached out to offer various ideas of how they could contribute), but also suited [c] The Games Cube, who can see the triumphant return of a Magic tourney, which was missed at our last event. Having something to work towards, knowing something is going to happen, is uplifting. To address our greatest challenge of staff levels, both in planning and running the event, we’re having a private Plan-and-Play event (including our games library) later this month for anyone committing to one or both of those abovementioned capacities. 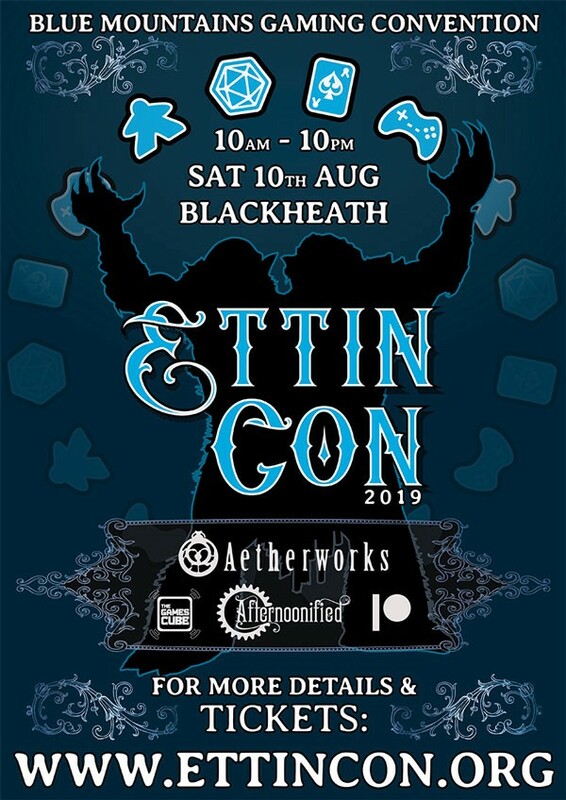 It will temporarily supplant our Summer event, though smaller in scale, with three hours of planning, brainstorming, and voluntary delegation, followed by three hours of gameplay and socialising. It will be so nice to dedicate some time to these ideas, have interested parties distribute the workload, contribute to the structure of the event, and get to know each other around the table. If you want in, and agree to the terms outlined in this paragraph, please visit EttinCon.org/volunteer, sending us an email before 15/01/2019 so we can give you access to the details. Lots of people have expressed interest and I’m hoping most of them can make it to the meeting. I’m still trying to figure out the most efficient way to use our three hours for planning, but I have drafted an idealised staff plan for us to work towards in terms of recruitment. If we can get 50–75% of those spots allocated before August, we’ll be in great shape. We’ve run with less before, but I’m aiming higher this time. At the very least, it’s great to be talking to so many people about the building the event, and hearing their enthusiastic responses! I’m really interested in seeing what improvements could be made to our processes across the board, from promotional avenues to the moment-to-moment intricacies of the event on the day. My ideal (as I babbled about in Ray’s podcast) is to have at least two staff at every station at any given moment, so that even when they are working a shift, they have company (and possibly a playmate) to chat and/or game with, especially during quiet moments. I usually push pretty hard for this, but we have more time (and more hands) to work towards it this time. I’ve been thinking about competitions or challenges for prizes or accolades — effectively achievements in general, for attendees of all kinds. We already run the Team Player program to encourage and reward a variety of fun and supportive activities, and role-playing GMs have a ranked leaderboard alongside their tiered rewards, the latter being based on our usual biannual model, which isn’t available to us this calendar year. If GMs have half the opportunities as we usually provide, how does that affect their rank/reward? Should we just cut the thresholds in half, or invent new types of supplementary achievements for them to unlock? Further to this, what about special events or challenges centred around certain concepts? We could have a prize-winning tournament (or maybe just some exclusive Team Player badges) designed around a marathon of three or four games which are either thematically or mechanically adjacent. A dexathlon of dexterity-based games, for example, for nimble players. Workshops and Discussion Panels where people can share their learnings about gameplay, game design, and any adjacent industry, play, design, craft, health, or social topics. Multi-table mega-games, like Aegon’s Conquest or God Emperor. Do you have any ideas to contribute to our convention? Please tweet them to us @EttinCon or email them through to info@EttinCon.org — we’d love to hear them, and if we use them we’ll ensure everyone is informed that you were the catalyst for their inclusion.